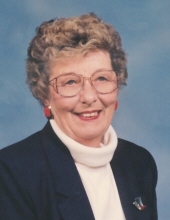 Funeral services for Arlene M. Leppke, 97, of Aberdeen, SD, will be 11:00am, Monday, February 11, 2019, at St. Paul’s Lutheran Church, Aberdeen, with Pastor Samuel Bobby officiating. Burial at Immanuel Lutheran Cemetery of Wecota, SD at a later date. Arlene died Wednesday, February 6, 2019 at Bethesda Home of Aberdeen. Visitation will be 3:00-7:00pm, Sunday, with family present from 5:00-7:00pm, followed by a prayer service at 7:00pm at Spitzer-Miller Funeral Home, 1111 South Main Street. Arlene Mae Heidenreich was born July 15, 1921 to Edward C. and Louise Meyer Heidenreich on the family farm three miles north of Northville, SD and grew up in this area. She was baptized and a confirmed member of Trinity Lutheran Church of rural Mansfield, SD. She went to school in Northville graduating with the class of 1939. She married Edgar Leppke on September 23, 1944 at Trinity Lutheran Church, Mansfield. She and Edgar made their home on a farm southwest of Cresbard, SD. Together, they worked on the farm. She was an active member of Immanuel Lutheran Church of Wecota, SD, serving as church organist for 25 years and teaching Sunday School. The Lord and church were very important to her. Arlene lost her husband in 1973 and moved off the farm and into Aberdeen, SD. She stayed busy doing volunteer work, delivering meals on wheels and playing piano for the RSVP Kitchen Band. She was a member of St. Paul’s Lutheran Church and was always willing to help out; including being a part-time organist. She will be sadly missed by her brothers: Loren Heidenreich, Aberdeen, Virgil (Arleen) Heidenreich, Northville, Marvin Heidenreich, Northville; sister, Elvira Tompulis, Minerva, OH; and many nieces and nephews for whom she was their favorite aunt. She was preceded in death by her husband, Edgar; her parents Edward C. and Louise Heidenreich; brother, Edward H. Heidenreich, and Sister, Anita Hartmann. In lieu of flowers, family prefers memorials to Aspire or your favorite charity. To send flowers or a remembrance gift to the family of Arlene M. Leppke, please visit our Tribute Store. "Email Address" would like to share the life celebration of Arlene M. Leppke. Click on the "link" to go to share a favorite memory or leave a condolence message for the family.